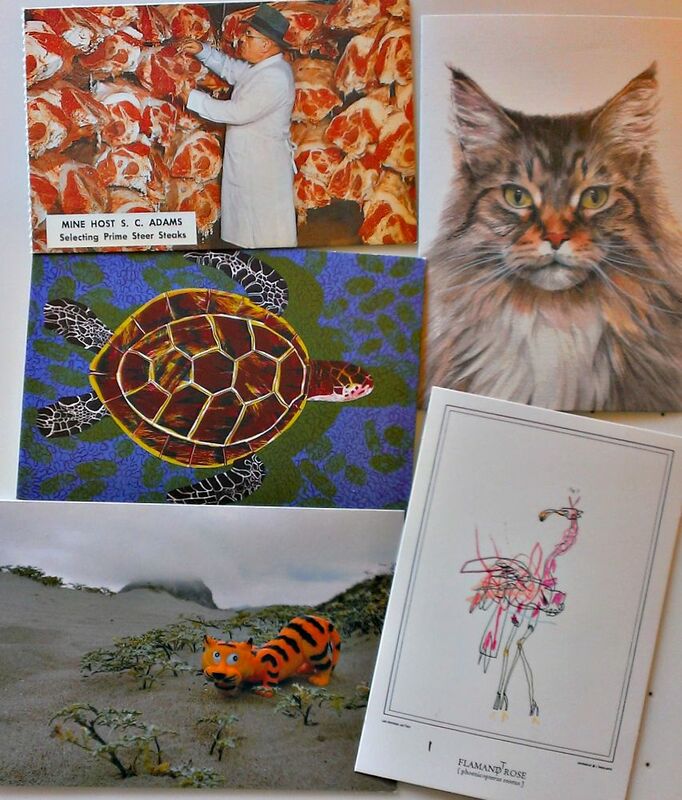 Four more Postcrossing draws this time. It’s a good time to mention that, hey, I bought some unique new postcards for my stash! I stopped in on the elephant seals at Piedras Blancas last week during a quick work-related day trip to northern San Luis Obispo county, California. I popped into a restaurant for a bite, and found that the place sold postcards with photos taken by the establishment’s proprietor! Two of them–the ones emblazoned “San Simeon, California”–are here. It’s an awesome thing to be traveling along the Pacific Coast Highway, near Hearst Castle, and then happening to spot a herd of zebras grazing on the east side of the road. They are vestiges of William Randolph Hearst’s private zoo, and their presence within view of Highway One always gets drivers pulling over & leaning over a barbed-wire fence to take snapshots. The zebra card is on its way to Turku, Finland, to a Postcrosser who says her favorite postcards “are landscapes or photos of your city.” This area is not my city, but I do find myself there an awful lot. The Postcrosser I drew in Mississauga, Ontario, Canada, actually wants postcards to be written to her grandmother, who was recently widowed. Grandma apparently likes stamps, so I sent one of my ugly postcards resurfaced with a layer of stamps. Well, I assume the shot on the card I sent her was at sunset–why else would it be so dark? And it’s kinda landscape-y, and a pretty famous sight–I mean, the parking lot was madness when I was there last week! Okay, these new cards are burning a hole in my postcards stash, so eager am I to unleash them on the world! I told her about the cam, too. I was watching the cam as I wrote the card, and I happened to see a couple of male elephant seals fighting, as a female scooted up the beach and away from the jerks. I told them that my favorite holiday is Spring Forward, and I was not making that up. “I have some DVDs…and I sometimes watch them.” I love that; it describes perfectly how I utilize my own home video collection. A lot of stuff gathering dust. As for her question, I answered it by saying I veer toward the “cuter” stuff: Ponyo, Borrowers Arrietty, and the amazing Spirited Away. Do you have a favorite Miyazaki / Studio Ghibli film? Stamps & postmarks down below–lots of nice stamps this time, and I am especially loving the jovial monkey! The first postcard is not a postcard, and I received it in a swap-bot “not a postcard” trade. This huge playing card–considerably bigger than a standard-sized postcard–came from a sender in Beachburg, Ontario, Canada. I guess she got about 52 postcards out of that deck! Mine was the three of hearts, as you may be able to see in the scan below. I don’t think I’ve seen “Black Jack” outside of a museum. I understand it to be one of Tezuka’s darker works, not the kind of sweetness & light that I prefer–but I should seek it out. As to pens, I think they can be great for coloring & for art, but for writing, I seek out a specific pen I’ve been buying by the box. I’m buying for legibility & smear-proof-osity-aciousness, and make my ink black! Here in the postcarding world, I’ve discovered that the fun pens can make for cards that are not at all easy (for me) to read. I had a recent incident where a Postcrosser had written the postcard ID in a shiny, light green ink (as I recall), and I had suuuuch a difficult time making out the number. I might have had to ask for help. I’ve had to do that upon occasion, and I’ve also had to take cards right up to a lamp. Now, just to make things clear (ahem), this card’s sender did right very clearly with black ink, and I had no trouble reading anything on her card. Let’s end at the top right, with that delicious food postcard from Taipei, Taiwan. It’s a regular Postcrossing card. Mango shaved ice, steamed buns (xlb)… I love it so much, it escaped my mind I’d already logged it here! The Disney Paradise Pier card is going out to Newmarket, Ontario, Canada, thanks to a Postcrossing Forum tag trade in which participants were to list what Disney-related postcards they might like to receive. The person I tagged wanted real Disney parks or hotels. This is a card that I was given as a guest customer of the Disney Paradise Pier Hotel. It’s my favorite of Disneyland’s three hotels! I like being out of the scrum. Of course, if you like basic hotel amenities–more of them, and without needless additional charges–the right choice is just about any of the off-site, non-Disney hotels. The other two cards are regular Postcrossing draws. I pulled TWO users in Asia! Those odds are practically impossible–especially as I don’t currently have any cards traveling to Netherlands or Belarus! The bridge card goes to someone in Beijing, China, who said he would like to receive bridge postcards, and the tiger is going to a cat lover in Taoyuan, Taiwan. So much catching up to do, after a need for computer repair left me for weeks with a frustrating, limited device (or as some people call it, a tablet). Five out through Postcrossing today! Since I have a lot of catching up to do, I’m not going to offer the amount of detail I usually attempt, but I’ll make a couple of brief notes about the cards & stamps. 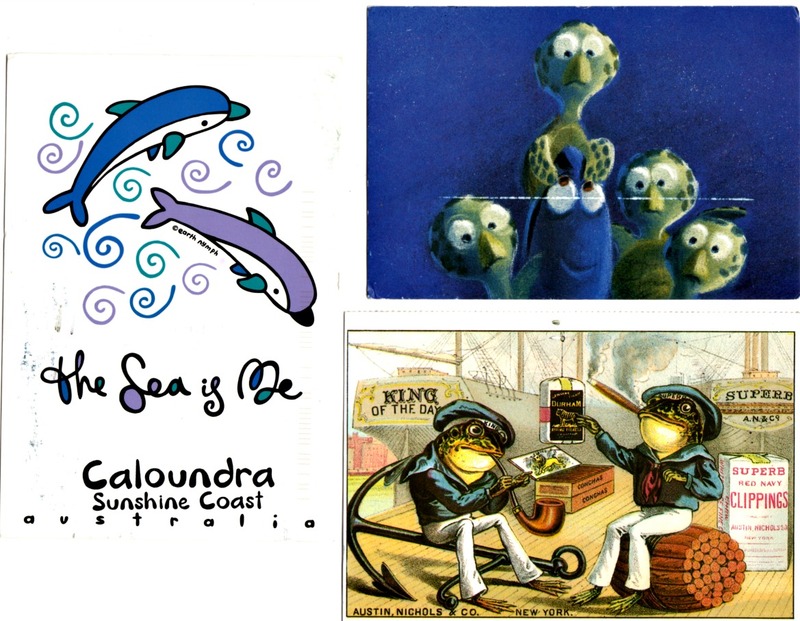 The three illustrated animal cards come from “The Animal Box: 100 Postcards by 10 Artists.” I do quite like the sea turtle stamp. I should also note that the Postcrosser in the Netherlands specifically said she likes flamingoes. The remaining, beautifully-photographed, card is my own work. 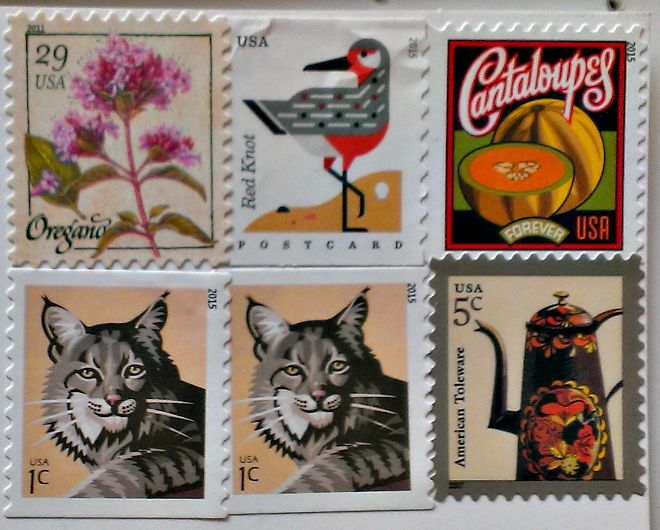 A couple of the outgoing cards are affixed with a small stamp collection, as you see below. I try to use as many stamps as possible to get up to the current $1.20 international rate when the Postcrossers say they are fans of stamps. Makes me want to check it out! The scene from Finding Nemo was sent from a swapper in Ontario, Canada. It was part of a book lovers’ swap, but I cannot share her list of favorite books with you, as the washi tape affixing it to the postcard tore off the text. It did spare the message underneath telling me in part that she lives near the Great Lakes, a beautiful area but with long winters–but she loves winter. A postcard of a taxidermied bear entered my collection, and I absolutely hated it (and it didn’t help that the description on the back is of when the bear was “taken,” and the score its hunter receieved). I didn’t imagine any scenario in which I might send this to an appreciative recipient–but then came the swap-bot “alter a postcard” trade. A few clippings from a worn-out Richard Scarry book, and we have a live bear, and a scene that could be out of out of Disney’s old Country Bears Jamboree attraction. It’s headed for a swap-botter in McLean, Virginia, who–uh-oh–may well hate the new version of the card as much as I hated the old one! 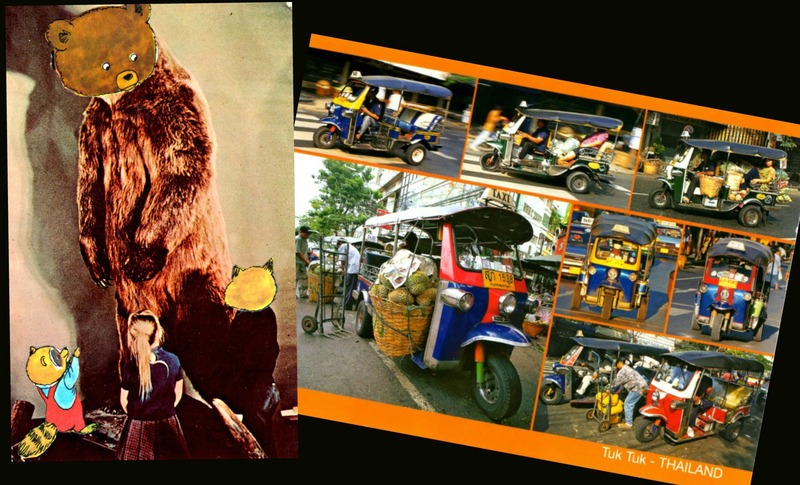 The tuk-tuk card is one I bought a couple of months back while in Chiang Mai, Thailand. I sent it out for a swap-bot “not my country trade,” to a recipient in Toronto, Ontario, Canada. I told her that it was awkward for me to enter tuk-tuks–I did so on my hands & knees, every time.